Wow! Two great new reviews for Reverb! “Reverb” By J. Cafesin was a “love story, a psychological thriller paced with romantic suspense.” I truly could not have said it any better because this was truly a story of redemption. I enjoyed the first POV from James Michael Whren and the other characters are in third person POV.. all giving the reader a good story. The author was able to create a emotional intensive feel that ring high from the ‘backstories’ on to a much needed happier ending that we were given in the end. The reader was able to feel the tension that radiated from James, his dad and the other characters to a point of making it seem you are there in the midst of it all. You will definitely find yourself being brought into James’s world. This author was able to use all of this through the ‘accusations, deep talks, revelations, and the many arguments only to bring out to the reader a good intriguing dialogue. In the end I can only say I thought “Reverb” was a awesome read that I could not put down until the end. However, be ready for a few scenes that maybe a little ‘graphic in nature and languages that push the boundaries’ for some of the faint hearted, but still I did like the way this author presented it all. “James Wren is brilliant, beautiful, wealthy, and taken – with himself, or more precisely, his genius for creating music. But on the evening of his brother’s funeral, his father turns James’ life upside down.” This is where the story will take off and James meets widowed Elisabeth and her young son Cameron. Now, to get the rest of it all I will say to get the rest of the story you must pick up “Reverb” to see how this author makes it all clear to the reader. The characters: James Whren, Edward Whren and Elisabeth Whitestone and her son Cameron were really the main characters who were colorful, real, even believable. However, for some of these characters you will be able to feel the ‘angst, anger, frustration, pain and betrayal’ that will be all up into this interesting story. I agree that “Reverb” was “fast paced, fascinating, shocking but most of all a riveting read” that I would recommend to you as some compelling story. I have looked at the book cover many times trying to figure it out…then it came to me…. 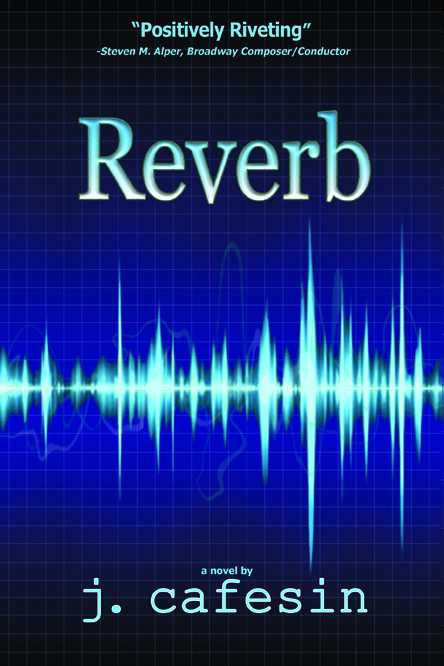 “Reverb” is all about James… who was of “echoes, repercussions, consequences, aftermath fallout to backlash.” Well done author J. Cafesin! Wow, I’m at awe! This was thinking outside the box (my prude box). A definite unforgettable tale and splendid storytelling. I was captivated from the very start and when I got to that (don’t what to spoil it for you), particular adult content , I yelp, “Oh no!”. My mind immediately thought that this was going in the direction that I didn’t want it to go ..just not my genre. But I kept reading and glad I did. It so happens that the incident was not to tantalize but clearly the opposite. It was crucial to showcase it in order to get into the source of James’ mentality. James’ story was remarkable because his odyssey to finding meaning in life was cause to reflect. Life definitely throws us wretched circumstances and those times can put us in a solipsism kind of thinking. In James’ case, fear “reverberated” (like his music) in his heart and motivated his steps. Although my fear is different from James’, I can certainly relate to the intensity and self-centered thought process. I want to throw the towel, I want to hide somewhere, I want to punch something, ..I want an eraser! Then we are rescued by love ones, a spiritual being, or what have you and then and only then comes the understanding that as horrible as that was, we’re stronger for the lesson it taught. That in turn puts you in the path to a happier and fulfilling you. That was part of the message I got from this read. Another was the saving graces that family plays in our psyche. A love story in the end. Edgy and dark getting there so it did leave me with a bit of a negative energy. This novel delivered main characters that poured out their souls, supporting characters that really added richness to the story, backdrops that followed the suspense well, meaningful lines, and a life affirming message. Well crafted, Ms Cafesin! I only recommend this book to mature readers because of its strong adult content.